The Cordoba VIP Tour is a varied day trip that takes about 10 hours. With our comfortable Land Rover Discovery we pick you up at your address (near Malaga) and then drive, via a scenic route, to the old city of Cordoba in less than two hours. Click on Information tab for a detailed description of the city. Cordoba is a particularly atmospheric city in Andalusia where fortunately, many remains of it’s glorious Moorish past can still be found. The city can measure itself with the two other famous royal cities of Seville and Granada and is well worth a visit. Cordoba is a friendly and very accessible city. Many of Cordoba’s highlights such as the Mezquita, the Cathedral, the Synagogue of Cordoba and the beautiful Alcázar can be visited on foot. 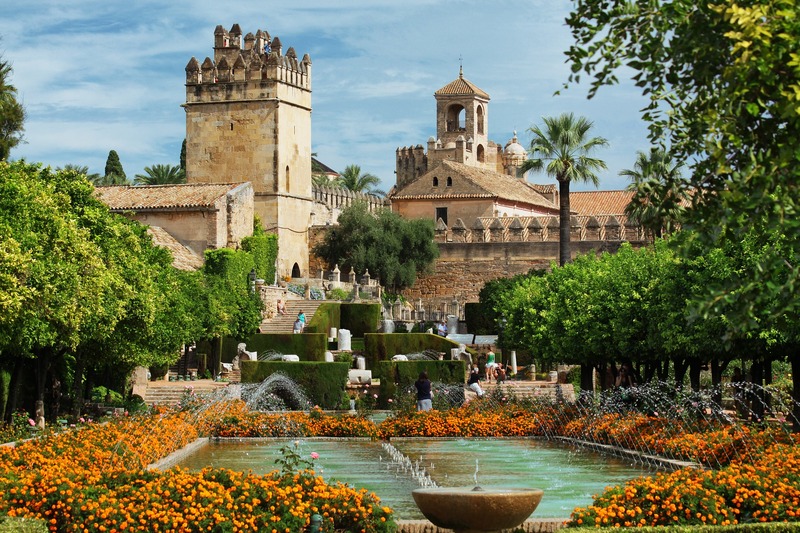 Cordoba is also known for its many patios, richly decorated with colorful flowers and plants. Obviously we will visit these important sights during our city walk with a professional guide. After the city walk there is plenty of time left for lunch and a visit of the famous Mezquita. We have already reserved your tickets. At the end of the afternoon we will drive you back to your hotel. An extensive city walk through the old city center with a fantastic guide. This tour is suitable for anyone who has a little bit of stamina. Comfortable shoes are recommended. This tour is especially interesting for lovers of culture and history. The tour may be less interesting for children younger than 15 years. Especially on warm, sunny days it is advised to bring a hat or cap, sunglasses and sunscreen. Cordoba is after all, one of the warmest cities in Spain. Bottles of cool water are waiting for you in our luxurious SUV with air conditioning. This tour is offered at a minimum of two and a maximum of 6 people. The price includes entrance tickets for the Mezquita, an extensive city walk and drinks in the car. Lunch is not included in the price. The prices below are for private tours, and include pick-up and return to a location in the Málaga area, entrée tickets and admissions, lunch, coffee and drinks. 2 people 175,00 euro p.p. The city of Cordoba lies in the valley of the river Guadalquivir at an altitude of 122 meters and has about 350,000 inhabitants. Cordoba is the hottest city in Europe and certainly in the months of July and August high temperatures must be taken into account. It is assumed that Cordoba was already inhabited some 40,000 years ago. For a long time the city was ruled by the North African ‘Carthagen’ until in the year 206 BC. when the Romans took power. In the year 411 Cordoba was in the hands of the East Germanic ‘Vandals’ for some time until in the year 711 when the Moors took over rulership and stayed here until the year 1236. In this year power was taken over by the Christians under the leadership of the Catholic King Ferdinand the third. In the 10th century, Córdoba was one of the most important cities in Europe. The city was at that time ruled by the Moors who, in the heart of the Jewish Quarter (Juderia), built their beautiful Mezquita. Construction of this Mosque began in the year 756. Fortunately, the Christians did not destroy this mighty mosque after the conquest in the year 1236. They must certainly have been impressed by this magnificent piece of Moorish architecture. What makes the Mezquita so unique is that the Christians decided to let the Mezquita exist in all its glory but built their own cathedral within the walls of this giant Mosque. Something you don’t see every day. Only when you enter the Mezquita by yourself, you will truly understand what this really looks like. Pay particular attention to the 860 beautiful red and cream-colored arches, the Moorish prayer house and the beautiful dome. The walled royal palace with a tower on every corner, was built in the 14th century and is located in the center of the city of Córdoba, close to the Mezquita and the synagogue. From the patio, you walk straight to the beautiful terrace gardens that exude an Arab atmosphere and here you might notice that these gardens show great similarities with the gardens of the Alhambra in Granada. The ‘Juderia’ is the old Jewish district of Cordoba and of course you will also find the Synagogue here. This well-preserved medieval synagogue was built in 1315 and consists of a courtyard, hall, prayer room and a gallery, intended for the women on the first floor. It is a great pleasure to stroll around this busy neighborhood through the old, narrow streets with their beautiful houses, monasteries and churches. Pay special attention to the old, very well preserved city walls.